The Crab Nebula, about 6,500 light years from Earth, is the scattered fragments of a supernova, or exploding star, observed by earthly skywatchers in the year 1054. Help EarthSky stay an independent voice! Donate now to help us keep going. 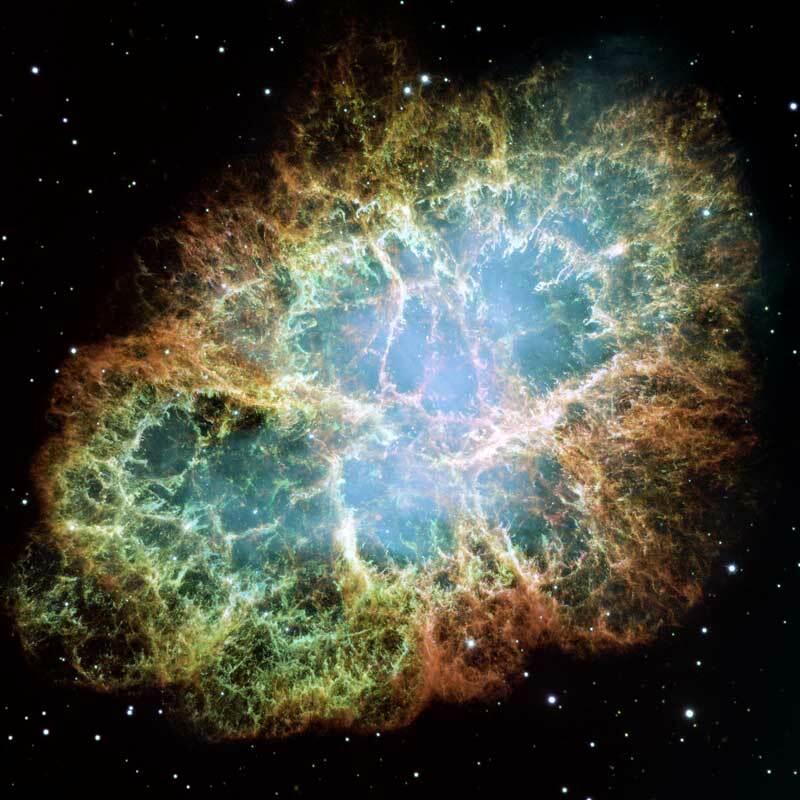 The Crab Nebula is so named because, as seen through a telescope with the human eye, it appears vaguely like a crab. In reality, it’s a vast, outwardly rushing cloud of gas and debris: the scattered fragments of a supernova, or exploding star. 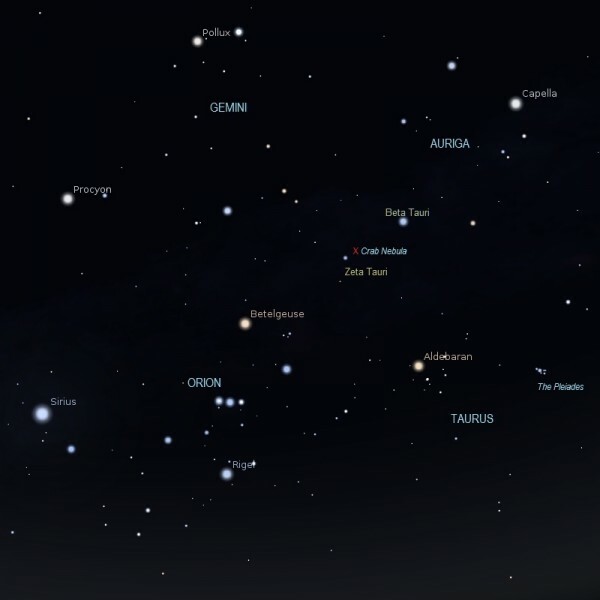 Earthly skywatchers saw a “guest” star in the constellation Taurus in July, AD 1054. Today, we know this was the supernova. The estimated distance to what’s left of this star – the Crab Nebula – is about 6,500 light years. So the progenitor star must have blown up some 7,500 years ago. Follow the links below to learn more about the Crab Nebula. 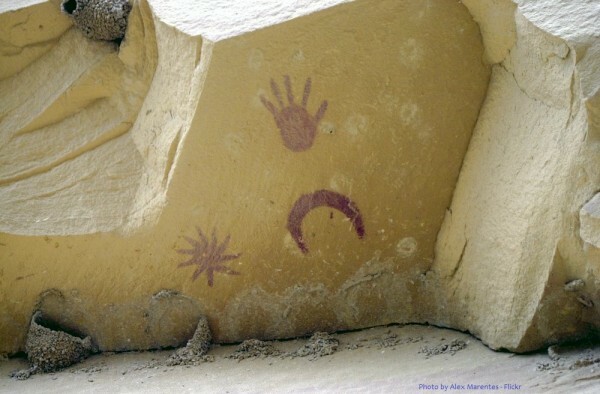 Anasazi pictograph possibly depicting the Crab Nebula supernova in AD 1054. Chaco Canyon, New Mexico. History of the Crab Nebula. 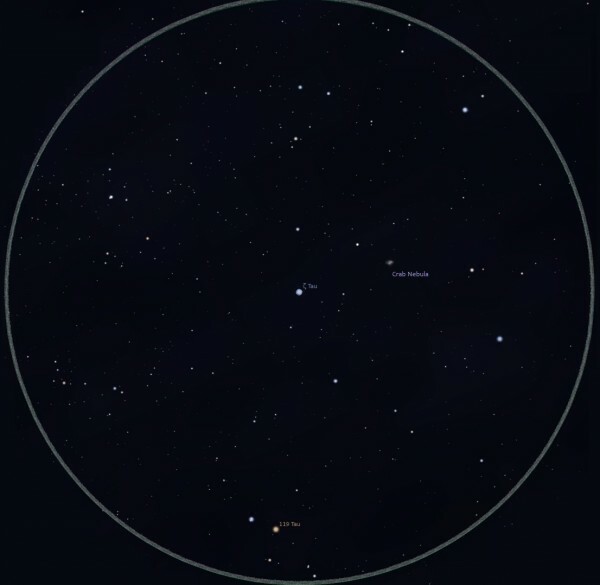 On July 4, in the year A.D. 1054, Chinese astronomers noticed a bright “guest” star near Tianguan, a star we now call Zeta Tauri in the constellation of the Bull. 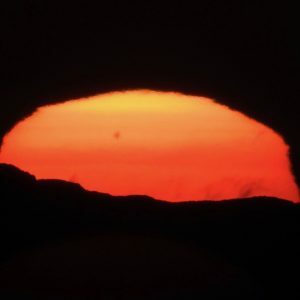 Although the historical records are not precise, the bright new star likely outshone Venus, and for a while was the third-brightest object in the sky, after the sun and moon. It shone in the daylight sky for several weeks, and was visible at night for nearly two years before fading from view. From June or July 1056, the object was not seen again until 1731, when an observation of the now quite faint nebulosity was recorded by an English amateur astronomer John Bevis. However, the object was rediscovered by French comet-hunter Charles Messier in 1758, and it soon became the first object in his catalog of objects not to be confused with comets, now known as the Messier Catalog. Thus, the Crab Nebula is often referred to as M1. In 1844, astronomer William Parsons, better known as the Third Earl of Rosse, observed M1 through his large telescope in Ireland. He described it as having a shape resembling a crab, and since then M1 has been more commonly called the Crab Nebula. However, it was not until the 20th century that the association with Chinese records of the 1054 “guest” star was discovered. View larger. | The Crab Nebula is located among some of the brightest stars and easiest-to-identify constellations in the heavens. 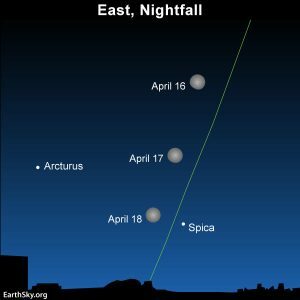 Best placed for evening observing from late fall through early spring, the Crab can be spotted very near the star Zeta Tauri. 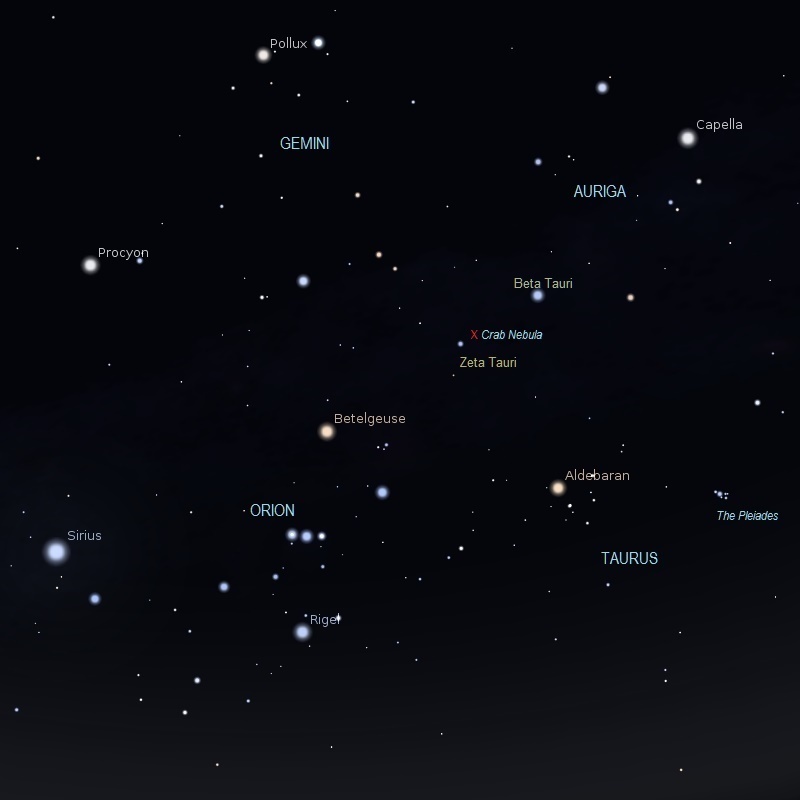 This chart courtesy of Stellarium. How to see the Crab Nebula. This beautiful nebula is relatively easy to locate due to its location near a bevy of bright stars and recognizable constellations. Although it can be seen at some time of night all year except from roughly May through July when the sun appears too close, the best observing comes from late fall through early spring. 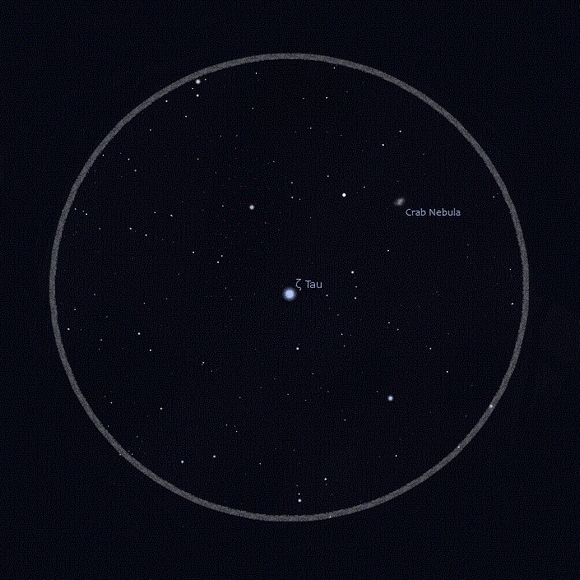 To find the Crab Nebula, first draw an imaginary line from bright Betelgeuse in Orion to Capella in Auriga. About halfway along that line you will find the star Beta Tauri (or Elnath) on the Taurus-Auriga border. Having identified Beta Tauri, backtrack a little more than a third of the way back to Betelgeuse and you should find the fainter star Zeta Tauri easily. Scanning the area around Zeta Tauri should reveal a tiny, faint smudge. It is located about a degree from the star (that’s about twice the width of a full moon) more of less in the direction of Beta Tauri. Binoculars and small telescopes are useful or finding the object and showing its roughly oblong shape, but are not powerful enough to show the filimentary structure or any of its internal detail. Simulated view of Zeta Tauri and Crab Nebula in a 7-degree field of view. Chart based on a screen save from Stellarium. The first eyepiece view, above, simulates a 7-degree field of view centered around Zeta Tauri, approximately what might be expected with a 7 X 50 pair of binoculars. Of course, the exact orientation and visibility will range widely depending on time of observation, sky conditions and so on. Scan around Zeta Tauri for the faint nebulosity. Simulated view of Zeta Tauri and Crab Nebula with 3.5-degree field of view. Chart based on a screen save from Stellarium. The second image, above, simulates an approximately 3.5-degree view, as might be expected with a small telescope or finder scope. To give you a clear idea of scale, two full moons would fit with room to spare in the space between Zeta Tauri and the Crab Nebula here. Keep in mind that exact conditions will vary. Science of the Crab Nebula. The Crab Nebula is the remnant of a massive star that self destructed in an enormous supernova explosion. This is known as a Type II supernova, a typical result for stars at least 8 times more massive than our sun. Astronomers have determined this through several types of evidence and reasoning including the following points. First, the bright new or “guest” star seen by Asian astronomers and others in 1054, just as would be expected by an exploding star. Second, the Crab Nebula has been located in the location indicated by ancient records as being where the “guest” star was seen. Third, the Crab Nebula has been shown to be expanding outward, precisely as the debris cloud from a supernova would. Fourth, spectroscopic analysis of the gases of the cloud is consistent with formation through a Type II supernova rather than other means. Fifth, a pulsing neutron star, a typical product of Type II supernova explosions, has been found embedded in the cloud. The lifetime of a massive star is complicated, especially near the end. Through its lifetime, its enormous mass provides enough gravity to contain the outward push of nuclear reactions in its core. This is called thermodynamic equilibrium. While the core is squeezed into a neutron star, the outer portions of the star bounce off and spread into space, forming a great cloud of debris, complete with common ingredients such as hydrogen and helium, cosmic dust, and elements produced only in supernova explosions. Bottom line: How to locate the Crab Nebula, plus history and science surrounding this fascinating region of the night sky.